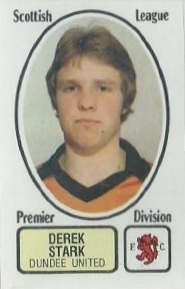 Derek was a schoolboy international who joined United on a provisional contract from Glenrothes Juniors in 1975. A cultured tough tackling defender who was just as capable in midfield, he was drafted into the squad for season 1976-77 and became a regular in the reserve line up. 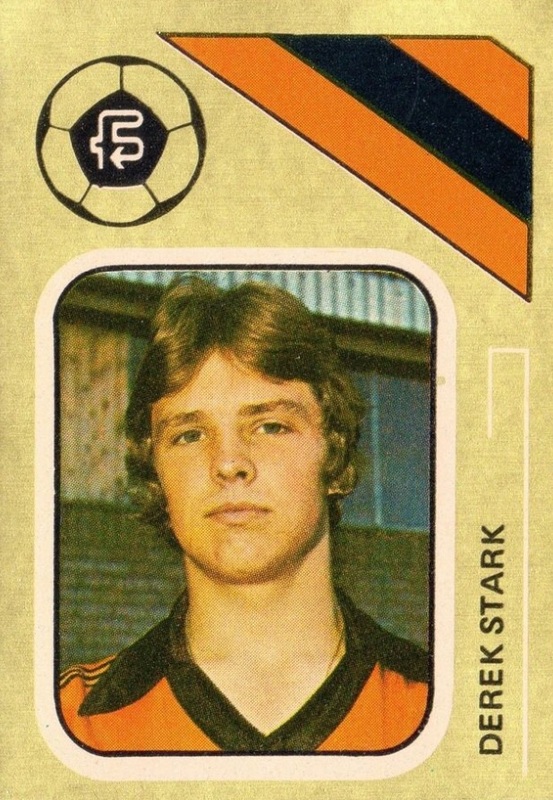 He made his first team debut a year later in August 1977 against East Fife in a friendly. Another season developing in the reserves brought a first appearance in major competition in May 1978, in a league match against Clydebank. 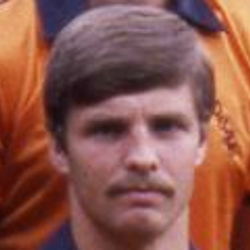 From the start of the next season, Derek was established in the defence and for six years he was a regular in the side. Originally a central defender, he was used more often as a full-back, and it was in this position that he appeared in the Club's first ever League Cup final in December 1979. After the 0-0 draw with Aberdeen at Hampden Park, the midweek replay was hosted at Dens Park, and it was Stark's low cross into the box that allowed Willie Pettigrew to put United ahead in the first half. United eventually ran out 3-0 winners to lift their first ever piece of silverware. The following season he helped United retain the trophy, playing in every round except the final itself, where he collected a winners medal as an unused substitute in the 3-0 victory over Dundee. Further Cup Final appearances followed, with runners-up medals in the Scottish Cup and the League Cup in 1981. 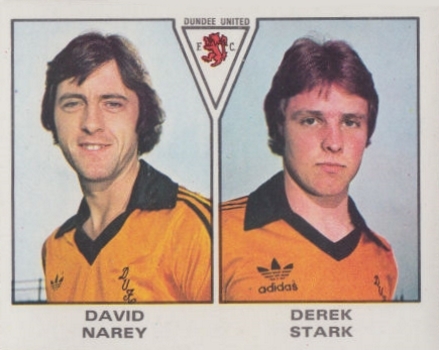 Although offered a full-time contract on several occasions, Derek remained a part-time player for the early period of his career, but was made redundant from his job at a coachworks company in Kinross. In December 1981, he walked out on United with the intention of joining the Police force, but was soon talked back into returning, eventually signing a full-time contract in 1982. A versatile player who, along with John Holt and Billy Kirkwood, could be relied upon to fill any outfield position, he was a vital member of the side that won the Premier League Championship in 1982-83. He missed only four of the 36 League matches of that campaign, as United became champions of Scotland for the first time. Derek was not known for his goal scoring, but when he did find the net, it was often spectacular. 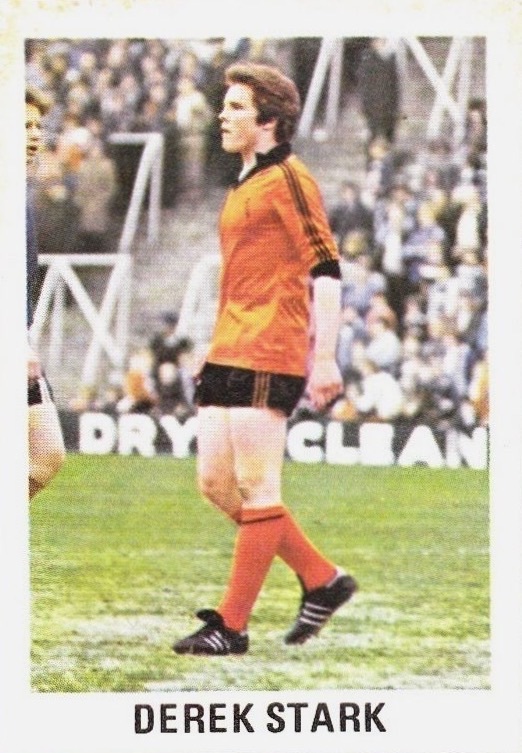 His first United goal came against Morton in March 1979, a blistering shot from at least 30 yards out that would have ended up in the allotments behind Tannadice if it wasn’t for the net. This goal was included in the BBCs Goal of the Season competition that year, but it wasn't his most famous goal, with his long rang effort against AS Roma in the European Cup semi-final of 1984 being the first memory when Stark’s name is mentioned. 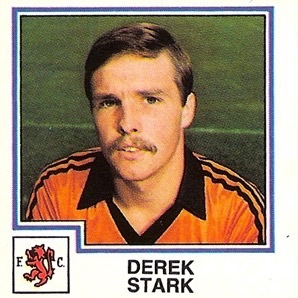 Unfortunately the 1983-84 season was to be Derek's last in senior football. Playing with a knee injury from the start of that campaign, it was towards the end of that season that a cyst on his cartilage began to cause problems. Several operations over the next 15 months failed to solve the problem, and in September 1985 he was forced to retire from the game at the age of 26. Returning to his idea from four years earlier, he then became a police officer with Fife Constabulary. For his contribution to the 1982-83 championship success, and the run to the European Cup semi-final, he ranks amongst the Club legends, and was inducted into the Dundee United Hall of Fame in February 2015. 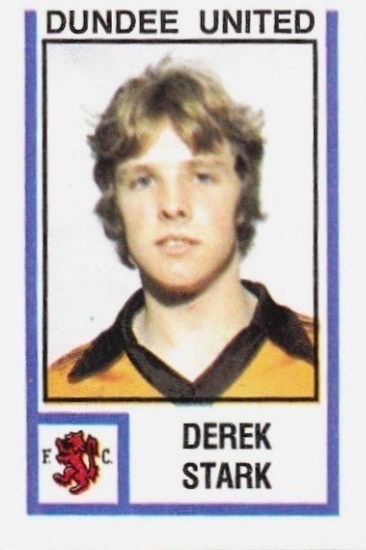 Derek was born on this date in Dunfermline. A night to remember as the Italiai aristocrats are humbled. Sturrock touches the ball back to Davie Dodds who shoots low into goal from eight yards. The opening half hour produced a proliferation of corners in United's favour, but a goal-line clearance from a Richard Gough header was the nearest to a goal. United began the second half in a more determined mood, Paul Hegarty hitting the woodwork and then heading narrowly past.